To the numerous Morozov family the artist Serov painted several canvases. Among them – “Portrait of I. A. Morozov”. The work was done in the mature years of the master – in 1910. Saying goodbye to youthful ease and romance, the Russian painter set about a series of portrait canvases, serious, thoughtful, even somewhat dramatic. I. 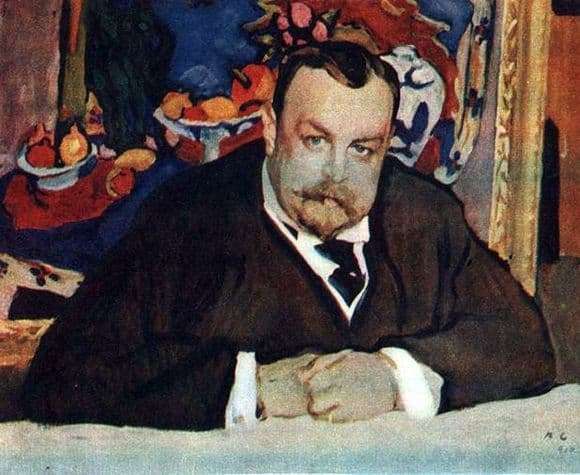 A. Morozov is a textile worker from Tver, as well as a great connoisseur of art, collecting works by Henri Matisse. Like the whole dynasty, it is noticeably rich, which is clearly recognizable by the features of the portrait. We see the background – a colorful painting by the French artist Matisse in a gilded frame. The great creation is blocked by the figure of a respectable man. He sits with his hands on a table covered with a clean snow-white tablecloth. Having spread his elbows to the sides, he as if tries to occupy the whole space. Feels satirically accusatory quality Serov in the shown work. The materially wealthy person is depicted in the foreground, leaving behind somewhere a masterpiece of art, blocking it with a monumental body. As if considering himself the most significant, he exposes his nature. He was able to buy the creation of Matisse and proud of himself. Easy to read contrasts of the canvas. The image in the frame is studded with bright dots of scarlet and yellow fruit, pinking buds in a vase against the background of blue and green painting. The man is wearing a brown jacket, his face is slightly pinking. Brown as a color of stability perfectly complements the appearance of a man who is confident in the future day. The portrait of I. A. Morozov is remarkable for its plasticity, depth of character transmission, and the invariable veracity of the Russian artist’s soul.